Irene Li, co-owner of the popular Boston food truck Mei Mei Street Kitchen, has big plans for the future: She wants to open the first brick-and-mortar Mei Mei restaurant together with her siblings and co-owners. She also wants to continue promoting the “social mission” of Mei Mei, using locally sourced foods and community atmosphere. But most importantly, she wants to butcher a pig. Li’s co-founders and family members, Andrew and Margaret “Mei” Li, said they are also excited to have a kitchen of their own in their upcoming Mei Mei restaurant, which will be located in Audubon Circle. The Li clan has wanted to open a restaurant for years, and with the help of a Kickstarter campaign, they raised more than $35,000 dollars. Finally, the Li family can create a space where diners can enjoy Mei Mei’s classic Chinese-meets-New England cuisine. Mei Mei Street Kitchen became a Boston staple through the development of its “Double Awesome,” a scallion-pancake breakfast quesadilla-meets-sandwich, with a gooey poached and fried egg, cheddar cheese and pesto. The Double Awesome, which Li called the “perfect drunk food and hangover food,” already sparked interest among the Boston epicurean community, receiving positive nods from Boston Magazine and The Improper Bostonian. In addition, socially conscious New England natives have admired Mei Mei’s dedication to promote local and seasonal ingredients since the beginning. The BU community is far from oblivious to the Mei Mei craze. Every Thursday morning, students and professors alike line up at the truck (parked in front of the Alfred L. Morse Auditorium) for their obligatory Double Awesome and often-daily specials. Li attributes part of the choice of new restaurant location, South Campus, to the positive relationship BU has with the Mei Mei team. BU’s Mei Mei fans can enjoy some of the truck favorites at the soon-to-open restaurant, along with a wider variety of options, depending on the time of day. The lunch menu will feature more street food options, including other scallion pancake sandwiches and curries. Li described the menu as “an expanded version” of the street kitchen menu at the same price point. The dinner menu, on the other hand, will split dishes into three options: Smaller “street food” dishes, medium-sized dishes and larger entrees, designed to be shared. Menu items will include homemade desserts, cheeses, local water seafood and pasture-raised chicken, beef and pork. Li said she is excited to start serving seafood and chicken, which were not options for the food truck menu. Mei Mei tries to use completely pasture-raised meat, and while this goal is fairly easy for serving beef and pork dishes, it is harder to pull off for chicken. Finding locally sourced pasture-raised chicken at a price that is cost-effective for a food truck is next to impossible. Now that the team is opening the restaurant, chicken can also become an option for the new menus. Sustainability is still core to the values and mission of Mei Mei, and the family has developed a diverse network of local farms, farm-direct programs and suppliers to plan a seasonal, environmentally friendly and regionally oriented menu. At Mei Mei, all of the meat and animal products served are sourced locally, or at least regionally. For example, the tofu used is locally sourced, and 95 percent of the produce Mei Mei uses is locally grown. Mei Mei has used over 43,000 pounds of local products since last April. “We’re really a restaurant and food truck with a social mission,” Li said. 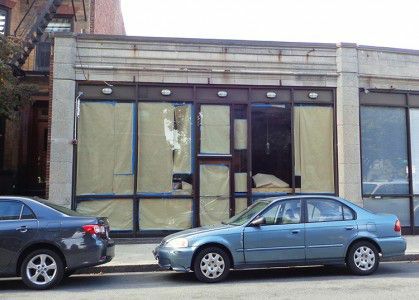 But above all else, the Li family wants to promote the Mei Mei restaurant as a home for the “students, young professionals and families” of the Audubon Circle area. Construction on the Mei Mei restaurant is complete and it will open later this fall.